Can be used in salad, stir-fry, stew, curry, soup, or as a garnish. Product totals 300g (three bags, 100g each). This vegetable mix is 100% organic, and comes pre-cut into convenient bite-size pieces so they can be quickly added to any dish – no washing, chopping, or peeling necessary! 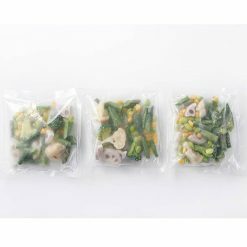 In addition, the vegetables are divided into single-serving 100g bags for easy portioning. If you are aiming to eat 120g of vegetables per meal, one bag (100g) is slightly under the desired quantity. However, the extra 20g can easily be added by mixing with things like mini tomatoes, lettuce, and miso soup. Broccoli and cauliflower, which are cruciferous vegetables, both contain phytonutrients. Broccoli, cauliflower, and asparagus all contain vitamin C. Broccoli also contains vitamins K and A, and is a good source of fiber. 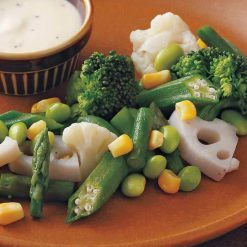 Asparagus and cauliflower both have lots of potassium, and asparagus is a good place to get folic acid. String beans contain carotenoids, which are antioxidants and are also good for your vision, and vitamins K and C.
Sugarlady’s vegetables are harvested in season and then frozen immediately in order to ensure the highest possible nutritional value and best flavor. Remove from the outer bag, and place in the microwave with the steam slit facing up. Heat for approximately the lengths of time listed below. Add your favorite sauce to the warmed vegetables and serve. For one bag (100g), heat for 2 minutes at 500W or 1 minute 40 seconds at 600W. The vegetables be added as-is to finished curry or cream stew, making the dish both colorful and healthy. They can also be used as the base for a salad, or stir-fried lightly with butter and used as a garnish for thickly sliced bacon or steak. To make a breakfast dish, lightly stir-fry, boil briefly in consomme soup, and add salt or soy sauce. When making stew or curry, add the frozen vegetables last. If you take a little bit out of a bag and add it to your bento box, what remains will be the perfect amount to use in making breakfast! This product contains organic broccoli, organic cauliflower, organic okra, organic lotus root, organic asparagus, organic sweet corn, organic edamame, organic string beans. Origin of ingredients: all vegetables contained (China). Prepared and packaged in China.